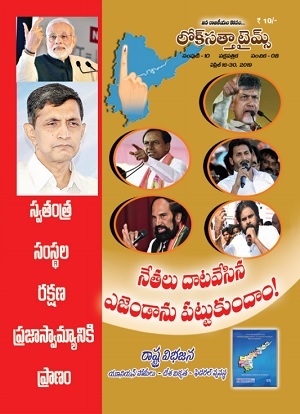 Lok Satta Party national President Dr. Jayaprakash Narayan will be addressing a public meeting at Tirupati on March 3 to enlighten people on the party’s role in safeguarding the interests of all regions in the State in wake of the Delhi decision to bifurcate Andhra Pradesh. Mr. Y. D. Rama Rao, Co-convener of the Lok Satta Party in Andhra Pradesh, said in a media statement today that Dr. JP would take part in an anti-corruption pledge at Kanipakam temple on the morning of March 3. At 4-00 p.m., he will take part in a two-wheeler rally from Padmavati Guesthouse to Nehru Stadium via Gandhi Road and Bhavani Circle and address a public meeting at 5-00 p.m.
Mr. Rama Rao lambasted Union Minister Jairam Ramesh for claiming the suggestions made by Dr. JP for ensuring justice to the three regions of the State as Congress Party’s own. He recalled that it was Dr. JP who in his January 18 Assembly speech proposed that special category status be provided to Rayalaseema and tax incentives offered to promote industrialization in Seemandhra. The BJP by and large owned up Dr. JP’s suggestions and pursued them whereas the Congress, which claims to be their author, did not incorporate them in the Andhra Pradesh Reorganization Bill. The need of the hour is visionary leadership which ensures a bright future for people, especially youth, in the two States. Mr. Rama Rao said Government of India and Congress Party did not bother to douse the flames of hatred among Telugu speaking people triggered by the Delhi decision to carve out Telangana. Congress, who did not heed Lok Satta’s repeated calls for arriving at a comprehensive and amicable solution through a dialogue between people’s representatives and other stakeholders, now preaches that joint action committees in the two States should work together. 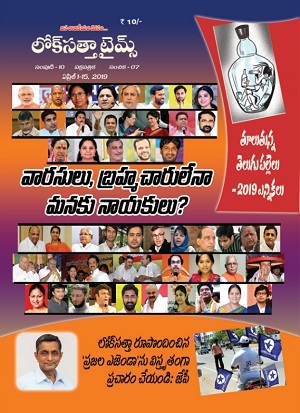 The people and their elected representatives in residuary Andhra Pradesh are competent enough to choose their capital without any fiat from Delhi or intervention of people like Central Ministers.